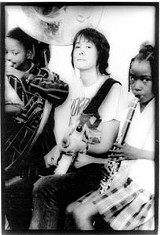 American story: Michelle Shocked, left, and friend. MICHELLE SHOCKED may not be a star or a household name in the music business, especially after a lengthy hiatus from the recording studio, but she is one artist who has truly declared and gained her independence. Her biggest battle occurred about six years ago when she was forced to pay for recording a CD, Kind Hearted Woman, and finance a tour herself because she was locked in a bitter contract dispute with Mercury Records, the label that had released her three critically acclaimed previous studio records--1988's Short, Sharp, Shocked; 1989's Captain Swing; and 1992's Arkansas Traveler. The label had refused to fund studio time for two proposed albums--one with a working title of Prayers and a version of Kind Hearted Woman--saying both records were stylistically inconsistent. What Shocked later discovered was that Mercury's decision was based less on artistic merit than on a desire to rework her record deal. As rarely happens in the music business, Shocked, 38, had negotiated ownership of her master tapes, and at the conclusion of her contract would control the release rights and royalties for her records. Mercury wanted to regain ownership. Shocked wouldn't surrender. When Mercury refused to let her record for another label, the two parties went to war. "I at first internalized a lot of rejection," Shocked says, explaining her initial reaction to Mercury's decisions. "I thought there was something wrong with me. And then as it went on down the road, I felt like they were behaving with an imperiousness, a high-handedness. "It brought out the anger that comes from--if you know a little bit about my background as a runaway--the abused-child syndrome," says Shocked (born Michelle Johnston), who at 16 ran away from home and soon after was briefly committed to a mental institution by her mother. SO SHOCKED decided to circumvent Mercury altogether, recording a solo guitar version of Kind Hearted Woman in a friend's garage. Armed with her CD, she then recruited two members of the Irish band Hothouse Flowers--Fiachna O'Braonain and Peter O'Toole (and on some shows, drummer Cedric Anderson)--and went on tour, selling her homemade discs at her shows. The tour and CD sales raised enough money to keep Shocked on the road for two years and enabled her to return to the studio to re-record Kind Hearted Woman, with O'Braonain, O'Toole, and Anderson fleshing out songs. In the meantime, she settled her dispute with Mercury and gained her freedom from the label. As part of the settlement, Mercury released a Shocked anthology CD, Mercury Poise. The new version of Kind Hearted Woman, meanwhile, was released four years ago on the Private Music label. The CD stands as a significant departure for the eclectic singer-songwriter. Her first three records, which Shocked views as a trilogy, showed three distinct sides to her music. Short, Sharp, Shocked was a singer-songwriter record full of bluesy, folk-rock tunes. Captain Swing was a swinging horn-filled record. Arkansas Traveler--which featured bluegrass legend Doc Watson and gospel great Pops Staples--explored Shocked's musical roots, with a collection of folk and blues songs she had learned while growing up, as well as some original material. By contrast, Kind Hearted Woman remains Shocked's most stark and emotionally charged record. It presents a series of stories about struggle, despair, and ultimately redemption, told by characters battling personal and professional setbacks while living in rural America. "What I've been experiencing is that on a superficial listen, the material does end up being perceived as very . . . someone used the word barebones," she says. "If you listen to it all, it does take you down into the depths, but before the journey's over, it's lifted you into, I don't know, this mood of acceptance or tolerance. I define it as redemption, myself, but most people have at least managed to capture a sense, a mood of something a little lighter than the despair." LOOKING BACK on her battle with Mercury, Shocked hopes she has helped trigger some improvements in how the record industry treats its artists. She has continued to follow a highly independent path over the past few years, hitting a creative high point and touring each year. She finished out 1999 with a special five-night stand at New York's Bottom Line, performing 30 songs she had written in 30 days with O'Braonain. "Well, I'm looking at it from a generational point of view. It's now the baby boomers who are running the labels," Shocked says. "But when they were coming up, they really received a lot of indulgence and nurturing from the record men, the guys who understood they were in the business of culture. And in the '80s corporate environment, as that generation came into power running the labels, they started giving the power to the bottom liners, the accountants, the lawyers; and as a result, even the good record men that remained were driven out. "It became seen as a negative to indulge the creative, the talent. And they really went back to a feudal system, like in the '50s, of one-hit wonders and producers writing the songs and double-dipping by producing the albums and getting the publishing and all that. "So from my generation, I just cannot go down without a fight," she adds. "You do not have to, if you're in the system, take a bunch of drugs and numb out, just be a loser or a slacker. You can be positive. You can have your wits about you, you can actually improve things. . . . I would like to see much more of a united front of artists who are exploited primarily because they allow themselves to be divided and conquered. "So if I can represent a generational shift and paradigm from 'we work inside the system and therefore we're already defeated' to 'we work inside the system and we're making it better for everybody,' I'll make the sacrifice of four years of standing up to a label like Mercury." Michelle Shocked performs Monday, June 12, at 8 p.m., at the Inn of the Beginning, 8201 Old Redwood Hwy., Cotati. Tickets are $15 in advance (available at the Last Record Store, Santa Rosa, and Backdoor Disc & Tape, Cotati), $18 at the door, 664-1522. From the June 8-14, 2000 issue of the Sonoma County Independent.